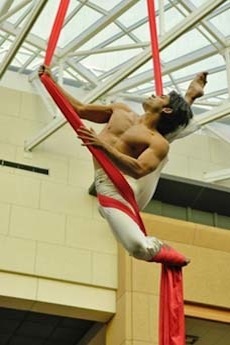 Sam Alvarez, Movement, Aerial and Acrobatics Coach for the Cabiri, began acrobatic training at age 6. He was a competitive diver and gymnast for many years. He began working in circus arts in the late 1990’s as a performer for Cirque du Soliel. He is trained in many styles of dance including ballet, jazz, modern, hip hop and Latin. He is an aerial and acrobatics specialist who has traveled the world performing with several international companies in festivals, cabarets and television shows. Most recently, he performed in Berlin, Germany — with the hit cabaret show, SOAP and is now on tour with Cavalia’s second show, Odysseo. While still performing, Sam continues to work as a trainer and choreographer for artists building acts and companies creating new shows, including the Cabiri.